Gregg Bradford is a Chicago chiropractor who serves Chicago and the surrounding communities in IL. Dr. Gregg Bradford has been helping people live pain free since 1991 in his clinic in Chicago, IL As a chiropractor with experience he is committed to promoting health and living life with optimum health. Dr. Bradford has been a licensed Chiropractor since 1989. He has practiced in this location since 1991. He is passionate about helping people live life with optimum health. Dr. Bradford's hobbies include running, biking, swimming (triathlons), skiing, scuba diving and hiking. 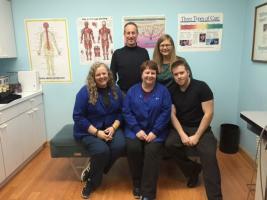 Our Team: We have two very talented and experienced massage therapists, Penny and John, who work with Dr. Bradford to help you reach your wellness goals. Lora is our office manager. She can help you with your appointments, explain your insurance benefits and answer any questions about them, and help you set up financial arrangements that allow you to get the care you need. Our staff is always available to answer any questions that arise. We are here for you! If you have any questions about our Chicago chiropractor, or would like to learn more about chiropractic care at Bradford Chiropractic, please call us at 773-631-6161 today!